We live in a time where wearable tech and smart technology can easily track our movements, exercise, sleep, shopping histories, eating and dating habits. We use smartphones for learning, social media, banking, connectivity to smart home related devices, and our cars are fitted with GPS monitoring devices for additional security and peace of mind or just to aid our mechanics with basic maintenance. This data collection of the most intimate aspects of our lives, is being recorded, stored, and often transmitted to third parties. Though this information can be useful to companies seeking to provide a better customer experience for you, this data can be invaluable to law enforcement agencies investigating criminal activity and the acquisition of this information raises significant Fourth Amendment or civil rights protection issues against unreasonable “search” or “seizure”. You have constitutional rights that must be protected, but that does not always prevent law enforcement or prosecutors from trampling on your rights to secure a conviction. Choosing Kamensky Cohen & Riechelson to represent you could be the most important decision you ever make. Call today to discuss your legal matter. Our attorneys will mount an aggressive defense whether you are an individual charged with complex federal and state crimes, drug related offenses, or a corporation seeking a dedicated partner to help protect your company’s intellectual property and commercial trade secrets throughout New Jersey and Pennsylvania. Our highly accomplished law firm breads of culture of commitment to our clients, with Partners who have spent decades honing our craft in local courtrooms. The Fourth Amendment, passed by Congress in 1789 and ratified in 1791, was based on protecting a now antiquated and narrow definition of “persons, houses, papers, and effects” and in this Internet Age, “effects” are no longer just inactive, static items, but objects that create and communicate data with other things. “Persons” now include clothing, bodily fluids, DNA, and corporations. “Houses” now include barns, apartments, and commercial spaces. “Papers” now include digital recordings, writings, business documents, and other communications. And currently numerous judicial scholars believe that “effects” should not only be the physical object but also the smart data and communicating signals emanating from the device. Has Someone Gained Unauthorized Access to Your Smart Devices or Wearable Tech? Although these smart devices are potential investigative tools for law enforcement, they can be misused by government agencies, business competitors and private persons to unlawfully spy on an individual. Such as in divorce proceedings by a suspicious spouse, a jealous partner or threatening or harassing ex, or an employer who gains unauthorised access to that person´s social media, wearable tech, smartphone, or computer, to surreptitiously gain insight into the movements, contacts and conversations. When done by an individual, unauthorized access such as this is also an invasion of privacy, and a violation of your protected Fourth Amendment rights against unlawful search and seizure. In the case of U.S. vs. KOLSUZ, 4th Circuit U.S. Court of Appeals ruled that under the Fourth Amendment, U.S. border authorities cannot search travelers’ cell phones and other electronic devices without individualized suspicion of wrongdoing. The court joins a growing number of judges who recognize that it is no longer justifiable to allow old rules from pre-digital cases to govern highly invasive searches of our digital data. As the law on searches and seizures at and near the U.S. border are ever evolving, it helps to have experienced legal counsel such as Kamensky Cohen & Riechelson. As the use of smart devices increase and the type of information collected grows, law enforcement’s use of these devices as evidence will expand rapidly. You have the right to safeguard your data against the misuse of the information that can be accessed and make sure that proper procedures and protocols are used to legally gain access to your private, confidential and often detailed information contained on these devices. 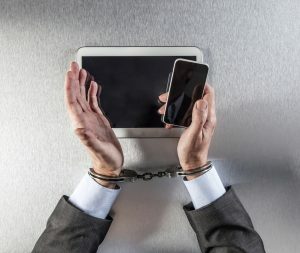 If you’ve been charged with a serious crime in NJ or PA and believe you have been subjected to an illegal search which violated your constitutional rights, or you have been accused of harassing or threatening someone else or someone you know has gained unauthorised access to your personal data, you are understandably worried about what’s going to happen next. When your freedom is at stake, talk to an experienced defense attorney who will protect your rights from the very start of the process. The lawyers of Kamensky Cohen & Riechelson, with offices in New Jersey and Pennsylvania, are fully committed to protecting your constitutional rights and defending all manner of criminal cases. The criminal defense attorneys of Kamensky, Cohen & Riechelson have extensive experience defending clients from unfair, unwarranted, and unreasonable searches of properties and electronic devices in Mercer County including Trenton, Lawrence, Princeton, and Pennington NJ. Our firm believes in aggressively defending our clients´ freedom, rights and property. You can rely on the experience we have cultivated since opening our doors in 1972. For a free and confidential consultation regarding your case, please contact us online or through our Lawrence offices by dialing (215) 337-4915 today.